Son Doong cave in Vietnam is one of the most beautiful natural caves and the largest ever found in the world. Hang Son Doong cave complex of Phong Nha – Ke Bang National Park, located in Son Trach, Bo Trach district, Quang Binh province of Vietnam Son Doong cave is one of the largest natural cave ever found in the world. Who first discovered as a peasant named Ho Khanh. In 1991, he happened to shelter in this cave while looking deep into the fores. Son Doong 9km long, 200m wide and 150m deep. Besides the beauty that anyone should see that breathlessly overwhelmed by nature’s masterpiece in Vietnam.. Cave was formed about 2 to 5 million years ago, ever since the cave has developed a cave ecosystems along the underground river and trees .. Although discovered in 1991, however, until 2006, when an expedition of the British Royal Society to search for new caves in Phong Nha – Ke Bang, his new Khanh brought his story to tell they listen and expedition decided to come here. Son Doong is much larger than Deer Cave in Malaysia, currently considered the world’s largest, an explorer said (Deer is 90 meters wide, 100 meters high and 2 kilometers long). 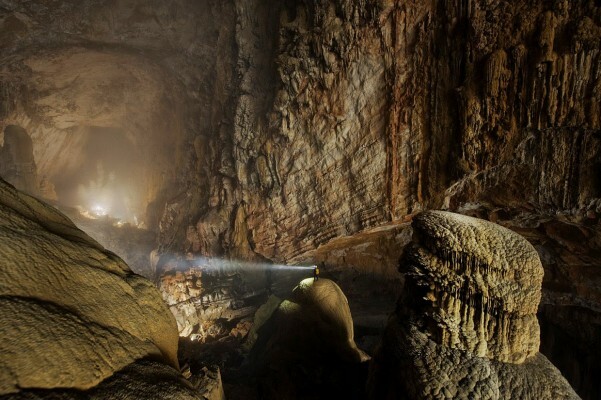 The Son Doong cave has replaced to take pole position as the world’s largest cave. bristish explorers have recently discovered that Son Doong is much larger than the world’s biggest known cave. On 13/5, Deputy Prime Minister Vu Duc Dam interview ABC News in the US TV program ‘Good morning’ -good Morning America – introduction to the Son Doong cave and the tourist attractions of Vietnam.